"WILCOX SILVER PLATE CO., Meriden, Conn. This company was originally organized in 1865 as the Wilcox Britannia Co. and in 1867 changed its name to Wilcox Silver Plate Co. They made silverplated hollowware and in 1869, took over Parker & Casper, a small hollowware concern. The Wilcox factory confined its production to silverplated hollowware which compared favorably with anything on the market at the time. A cut glass department was begun in 1885 and continued in operation for about twenty-five years. When Wilcox Silver Plate Co. was taken over by International Silver Co. in 1898, its lines were continued, with the later addition of the Barbour and Webster lines of silverplated hollowware. The factory was closed in 1941, but the brand continues today [as of 1977].... The trademark was changed to Webster-Wilcox in 1960." — Edmund P. Hogan in An American heritage: A book on the International Silver Company (1977), p. 164. Yale University call no. 2009 Folio 59. Offline - Connecticut Historical Society, Hartford, call no. F974.62 M651f. University of Connecticut Library, Storrs, call no. NK7240.5 .H63 1980. (5 August 1868). State correspondence [with "Meriden" section and mention of Wilcox Silver Plate Co.] Hartford Courant, p. 2. (Viewed 20 October 2018. D00410). Messrs. West & Co., No. 80 Washington street, presumably Chicago. (30 March 1869). Advertisement: "... Wilcox Silver Plate Co. ..." [with no illustrations]. Chicago Tribune, presumably p. 4, col. 4. (Viewed 28 September 2018. B00547). (June 1869). Advertisement: "Wilcox Silver Plate Co. ... Salesroom, No. 21 Maiden Lane, New York..." [no illustrations]. The New York Tribune. (Viewed 6 October 2018. B00784; B00786-87). Online - Chronicling America project, Library of Congress: 16 June 1869, p. 8, col. 6; 23 June 1869, p. 8, col. 5; 30 June 1869, p. 8, col. 5. (3 December 1873). The pride of Lexington; a magnificent display of goods for the Christmas holidays [at Messrs. Grimes & Venable, presumably Lexington, Missouri; with mention of Wilcox Silver Plate Co.] Lexington Weekly Intelligencer (Lexington, Missouri), presumably p. 3, col. 4. (Viewed 28 September 2018. B00548). (18 December 1873). Christmas is coming!! Where to ho to buy presents for the occasion [at Marshall and Cady, presumably Rutland, Vermont, with mention of Wilcox Silver Plate Co.] Rutland Weekly Herald (Rutland, VT), p. 5, col. 3. (Viewed 28 September 2018. B00549-50). (11 December 1876). Presentation to General Hawley [with mention of Wilcox Silver Plate Co.] Hartford Courant, p. 1. (Viewed 16 December 2018. D00386). Missouri State Museum, St. Louis, call no. Trade catalog Wilcox Silver. Vosbury Bros., Binghampton, NY. (26 April, 3 May 1878). Advertisement: "We keep the largest and finest stock of Silver and Plated Ware ever shown in Binghampton... Wilcox Silver Plate Co. ..." [with no illustrations]. The Union News (Union, New York). (Viewed 14 October 2018. B01059-60). Wilcox Silver Plate Co. (November - December 1878). Advertisement: "Wilcox Silver Plate Co., Manufacturers of Superior Electro-Plated Ware, No. 21 Maiden Lane, New York. Factories, Meriden, Ct., A full assortment of elegant goods at attractive prices" [no illustrations]. New York Daily Tribune. (Viewed 22 September 2018. B00349; B00372-76). Online - Chronicling America project, Library of Congress: 6 November 1878, p. 8, col. 6; 13 November 1878, p. 8, col. 6; 28 November 1878, p. 8, col. 5; 11 December 1878, p. 8, col. 5; 18 December 1878, p. 10, col. 3; 25 December 1878, p. 8, col. 6. S. William Babbitt, assignor to Wilcox Silver Plate Company. (8 January 1878; filed 19 December 1877). Letters patent no. 199,010: Improvement in covered butter-dishes. (Viewed 26 March 2018. AAA01552). S. William Babbitt, assignor to Wilcox Silver Plate Company. (29 January 1878; filed 14 January 1878). Letters patent no. 199,772: Improvement in covered butter-dishes. (Viewed 26 March 2018. AAA01553). S. William Babbitt, assignor to Wilcox Silver Plate Company. (11 June 1878; filed 25 May 1878). Letters patent no. 204,784: Improvements in covered dishes. (Viewed 26 March 2018. AAA01557). 1878 - patent - improvement in pitchers. S. William Babbitt, assignor to Wilcox Silver Plate Company. (13 August 1878; filed 26 July 1878). Letters patent no. 206,997: Improvement in pitchers. (Viewed 26 March 2018. AAA01558). S. William Babbitt, assignor to Wilcox Silver Plate Company. (27 August 1878; filed 26 July 1878). Letters patent no. 207,475: Improvement in waiters. (Viewed 26 March 2018. AAA01559). (5 May 1879). Meriden manufactories: The Wilcox Silver Plate Co. Hartford Courant, p. 4. (Viewed 16 December 2018. D00407). Wilcox Silver Plate Co., New York / West Meriden, CT. (November - December 1879). Advertisement: "... Manufacturers of Plated Tea Sets, Porcelain Lined Ice Pitchers, Castors, Waiters... " The Rock Island Argus (Rock Island, Illinois). Viewed 15 October 2018. B01081-84). Wilcox Silver Plate Co. (December 1879). Advertisement: "Silver plated ware; Elegant display of new designs in novelties for wedding and holiday gifts; manufactured by Wilcox Silver Plate Co., 6 Maiden Lane" [New York] [with no illustrations.] New York Tribune. (Viewed 29 September 2018. B00581-83). Online - Chronicling America project, Library of Congress: 3 December 1879, p. 8, col. 6; 7 December 1879, p. 12, col. 5; 23 December 1879, p. 8, col. 4. S. William Babbitt, assignor to Wilcox Silver Plate Company. (30 September 1879). Letters patent no. 220,050; filed 4 September 1879: Improvement in ice-pitchers. (Viewed 15 March 2018. AA01166). Click the following link to see the parallel webpage - Wilcox Silver Plate Co. in collections, at auction, and in exhibitions. H. Z. Rhoads & Bro., Jewelers, presumably Lancaster, PA. (28 June 1880). Advertisement: "Electro Silver Plated Hollow Ware of the... Wilcox Silver Plate Company... " [no illustrations]. Lancaster Daily Intelligencer (Pennsylvania), presumably p. 3, cols. 4-5. (Viewed 3 October 2018. B00707). Bullard & George, presumably Watertown, NY. (4 October 1880). Advertisement: "Solid and silver plate ... Wilcox Silver Plate [Co.] ... " [with no illustrations]. Watertown Times (Watertown, NY), p. 1, col. 7. (Viewed 14 October 2018. B01075). S. William Babbitt, assignor to Wilcox Silver Plate Company. (7 December 1880; filed 15 October 1880). Letters patent no. 235,192: Plate for butter-dishes. (Viewed 15 March 2018. AAA001167). University of Delaware, Newark, call no. FOLIO+ Trade Catalog. Smithsonian Institution, Washington, DC, NMAH call no. 046185. National Museum of American History library, Smithsonian Institution, Washington, DC, record id no. SILNMAHTL_39546 (photocopy of original). Wisconsin Historical Society Library, Madison, Pamphlet Collection 52- 4198. Offline - Connecticut Historical Society, Hartford, call no. Q974.62 M651wy. Search worldcat.org for more locations. (20 September 1881). The State Fair [with mention of Wilcox Silver Plate Co.]. Meriden Daily Republican, pp. 1-2. (Viewed 29 September 2018. (B00573-79). (23 September 1881). The state fair [including mention of Wilcox Silver Plate Co.]. Morning Journal and Courier (New Haven, CT), presumably p. 2, col. 4. (Viewed 29 September 2018. B00568-69). "The Wilcox Silver Plate Co. show beautiful silver plated ware. Among the many articles are some new designs." (23 September 1881). The State Fair [with mention: "... Diplomas were awarded to the following named for articles manufactured or displayed by them ... Wilcox Silver Plate Co., silver-plated ware ..."]. Meriden Daily Republican, pp. 1-2. (Viewed 29 September 2018. B00570-72). I. G. Dillon, presumably Wheeling, WV. (2 May 1881). Advertisement: "Fine silverware! ... Wilcox Silver Plate Co. ... " [with no illustrations]. Wheeling Register (West Virginia). (Viewed 11 October 2018. B00931-36). Online - Chronicling America project, Library of Congress: 2 May 1881, presumably p. 2, col. 4; 13 May 1881, presumably p. 2, col. 5; 14 May 1881, presumably p. 2, col. 5; 16 May 1881, presumably p. 2, col. 7; 21 May 1881, presumably p. 2, col. 3; 25 May 1881, presumably p. 2, col. 4. (20 December 1882). State news [including mention: "... Wilcox Silver Plate company [pays taxes on] $202,300... " Morning Journal and Courier (New Haven, CT), presumably p. 4, col. 3. (Viewed 29 September 2018. B00584). Webster Bros. & Co., Brooklyn, NY. (12, 14 November 1883). Advertisement: "... Wilcox Silver Plate Co. ..." The Brooklyn Daily Eagle (Brooklyn, NY), p. 1, cols. 1-2. (Viewed 16 October 2018. B01102-03). Wilcox Silver Plate Co. (13 November 1883). Advertisement: "Wilcox Silver Plate Co., Manufacturers of the Finest Quality of Electro-Plate..." Meriden Daily Republican, p. 1, column 8. (Viewed 9 September 2017. G00265). Online - Courtesy Yale University. For other maps, see historical Meriden maps online. H. C. Buchanan & Co., Aberdeen, MS. (10 January 1884). Advertisement: "... Wilcox Silver [Plate Co.] Ware... " The Aberdeen Examiner (Aberdeen, Mississippi), presumably p. 4, col. 2. (Viewed 7 October 2018. B00806). Chicago Bargain House / Hull Brothers, presumably Wichita, KS. (August 1884). Advertisement: "... Wilcox Silver Plate Co. ... " [no illustrations]. Wichita Daily Eagle (Kansas). (Viewed 20 October 2018. B01159-61). Online - Chronicling America project, Library of Congress: 3 August 1884, presumably p. 4, cols. 6-7; 5 August 1884, presumably p. 4, cols. 6-7; 6 August 1884, presumably p. 4, cols. 6-7. Harvard University library, Hollis no. 006932494. Brooklyn Museum of Art call no. NK7241.5 W64. Wilcox Silver Plate Co. (4 February 1886). Advertisement: "Wilcox Silver Plate Co., Manufacturers of the Finest Quality of Electro-Plate..." Meriden Daily Republican, p. 1, column 1. (Viewed 9 September 2017. G00226). Robert H. Budde, assignor to Wilcox Silver Plate Company. (10 May 1887; filed 30 March 1887). Letters patent no. 362,815; serial no. 232,959: Method of ornamenting hollow metal articles. (Viewed 16 March 2018. AAA01203). (October 1888). Trade gossip (with mention of Wilcox Silver Plate Co., their New York showroom at 6 Maiden lane, and new goods displayed). The Jewelers’ Circular and Horological Review, p. 107. (Viewed 8 September 2018. L00731). (2 October 1888). Annual rifle tournament; of the National Guard to be held at Hartford this month [with mention: The first prizes for this event include a Wilcox Silver Plate Company cup]. Morning Journal and Courier (New Haven, CT), presumably p. 4, col. 2. (Viewed 1 October 2018. B00623-24). (10 October 1889). Our guests: Honored visitors here to-day [including small section describing exhibited Wilcox Silver Plate Co. wares]. Meriden Daily Journal, p. 1. (Viewed 15 September 2018. L00769-83). (11 October 1889). Compliments for Meriden: What outsiders say about her enterprise [excerpts from Hartford Courant, New Haven Register, New York Herald, and New York Tribune, with no specific mention of Wilcox Silver Plate Co.]. Meriden Daily Republican, p. 1. (Viewed 14 September 2018. L00747-50). (11 October 1889). The show photographed: Fine pictures of the Opera House exhibit made. ["The best of them will be forwarded to Frank Leslie’s paper— what the state and New York press has to say about Meriden", with excerpts from Hartford Courant, Hartford Times, New Haven Register, New York Herald, New York Tribune, Waterbury Republican, with no specific mention of Wilcox Silver Plate Co.] Meriden Daily Journal, p. 1. (Viewed 14 September 2018. L00785-89). (August 1890). Trade gossip [with paragraph about Meriden Britannia Co., Wilcox Silver Plate Co., and E. A. Bliss Co.] The Jewelers’ Circular and Horological Review, p. 87. (Viewed 4 September 2018. F00246-47). (September 1890). The death of Horace Wilcox ["The king of the silverware trade is dead", with reference to Meriden Britannia Company and mention of Wilcox Silver Plate Company]. The Jewelers’ Circular and Horological Review, p. 31-2. (Viewed 4 September 2018. F00249-52). Seth Wm. Babbitt, assignor to Wilcox Silver Plate Company. (14 January 1890; 14 May 1889). Letters patent no. 419,597; serial no. 310,716: Brush. (Viewed 21 March 2018. AAA01371). Seth William Babbitt, assignor to Wilcox Silver Plate Company. (18 March 1890; filed 24 December 1889). Design no. 19,701; serial no. 334,895: Design for the ornamentation of silver or other table-ware. (Viewed 21 March 2018. AAA01372). Wilcox Silver Plate Co. (2 January 1891). Advertisement: "Wilcox Silver Plate Co., Manufacturers of the Finest Quality of Electro-Plate..." Meriden Daily Republican, p. 4, column 1. (Viewed 9 September 2017. G00222). I. G. Dillon & Co., presumably Wheeling, WV. (December 1891). Text-based advertisement: "... Silverware ... Wilcox Silver Plate Co. ..." [with no illustrations]. Wheeling Daily Intelligencer (West Virginia). (7 October 2018. B00795-96). Online - Chronicling America project, Library of Congress: 18 December 1891, p. 2, col. 2; 23 December 1891, p. 4, col. 4. Seth William Babbitt, assignor to Wilcox Silver Plate Company. (2 June 1891; filed 24 April 1890). Letters patent no. 453,571; serial no. 349,319: Cheese-holder. (Viewed 21 March 2018. AAA01373). Seth Wm. Babbitt, assignor to Wilcox Silver Plate Company. (16 June 1891; filed 9 July 1888). Letters patent no. 454,149: Machine for embossing works in sheet metal. (Viewed 21 March 2018. AAA01374). Woodward & Lothrop, Washington, DC. (18 November 1892). 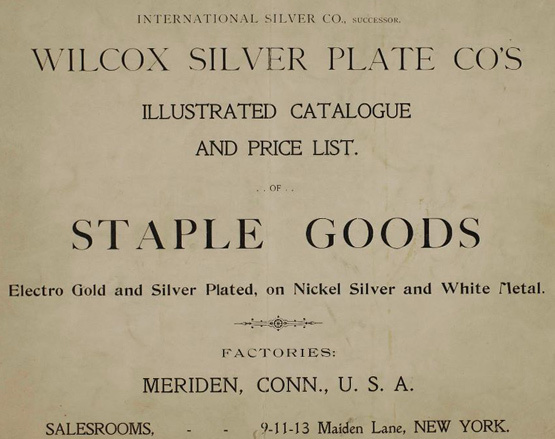 Advertisement: "... Wilcox Silver Plate Company... " [with no illustrations]. Evening Star (Washington, DC), p. 5, cols. 4-5. (Viewed 7 October 2018. B00802). Woodward & Lothrop, Washington, DC. (2 December 1892). Advertisement: "... Wilcox Silver Plate Co. ... " [with no illustrations]. Evening Star (Washington, DC), p. 4, cols. 4-5. (Viewed 7 October 2018. B00803-04). Seth William Babbitt, assignor to Wilcox Silver Plate Company. (24 January 1893; filed 9 May 1892). Letters patent no. 490,422: Letter-scale. (Viewed 21 March 2018. AAA01375). Charles A. Miller, assignor to Wilcox Silver Plate Company. (5 September 1893 Letters patent no. 504,534, serial no. 463,806: Letter-scale. (Viewed 21 March 2018. AAA01376). R. Harris & Co., Washington, DC. (10 October 1894). Advertisement: "... Wilcox Silver Plate Company... " [with no illustrations]. Evening Star (Washington, DC), p. 6, col. 3. (Viewed 7 October 2018. B00805). Winterthur Museum, Delaware, call no. TP868 B85k. (12 August 1895). Meriden’s factories [including mention of Wilcox Silver Plate Co. as the 7th largest factory in Meriden]. The Daily Morning Journal and Courier (New Haven, CT), p. 3, col. 1. (Viewed 27 September 2018. B00517-18). Palais Royal, Washington, DC. (22 May 1895). 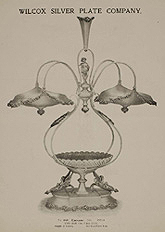 Advertisement: "... Wilcox Silver-plated candelabra... candlestick... " [with no illustrations]. Evening Star (Washington, DC), p. 7, col. 1. (Viewed 7 October 2018. B00800-01). Emil Steinmann, Sacramento, CA. (December 1895). Advertisement: "... Wilcox Silver Plate ..." [with no illustrations]. The Record-Union (Sacramento, California). (Viewed 6 October 2018. B00791-94). Online - Chronicling America project, Library of Congress: 16 December 1895, p. 3, col. 5-6; 17 December 1895, p. 3, col. 5-6; 18 December 1895, p. 3, col. 5-6; 19 December 1895, p. 3, col. 5-6. Wilmarth & Edmonston, Washington, DC. (3 February 1897). Advertisement: "... Wilcox Silver Plate Co. ..." [with no illustrations]. Evening star (Washington, DC), p. 11, col. 3. (Viewed 6 October 2018. B00788). Chas. R. Edmonston, Washington, DC. (2 November 1897). Advertisement: "... Wilcox Silver Plate Co. ..." [with no illustrations]. Evening star (Washington, DC), p. 8, col. 5. (Viewed 7 October 2018. B00799). Wm. Hengerer Co., Buffalo, NY. (31 October 1898). Advertisement: "... High Grade Silverware... Bake Dish— Wilcox Silver Plate Co. ... with rococo border... " Buffalo Courier (New York), p. 4, cols. 5-7. (Viewed 12 October 2018. B00985). Smithsonian Institution, Washington, DC, call no. PR3991.A1 T84 1890z. Sowerby, J. G. (18—?). At home. 36 pp. Wilcox Silver Plate Co.: Meriden, CT. (Viewed 19 August 2018. L00613). Winterthur Museum, Garden & Library, Delaware, call no. NK7240 W66a TC. The Wilcox Silver Plate Co. became part of the International Silver Company in 1898. After this date, it is assumed that any design patents utilized by the Wilcox Silver Plate Co. division or brand were assigned to the International Silver Company. (See the ISC historical documentation page). (17 June 1899). To close its plant (with mentions of the Middletown Plate Co. and Wilcox Silver Plate Co. [/ International Silver Co.]) New York Tribune, p. 6, cols. 1-2. (Viewed 13 October 2018. B01006-07). Walbridge’s, Buffalo, NY. (December 1899). Advertisement: "Silverware... Wilcox Silver Plate Co. [/ International Silver Co.] ..." [without relevant illustrations]. Buffalo Evening News (New York). (Viewed 13 October 2018. B001011-14). (5 February 1900). [No article heading; listing the Wilcox Silver Plate Company as "Factory N" of the International Silver Company]. The Daily Morning Journal and Courier (New Haven, CT), p. 1, col. 7. (Viewed 29 September 2018. B00566-67). International Silver Company. (6 March 1902). Advertisement: "International Silver Co., Silversmiths, Successor to Barbour Silver Co.; Meriden Britannia Co.; Meriden Silver Plate Co.; Wilcox Silver Plate Co.; Meriden Cut Glass Co., and others..." Meriden Weekly Republican, p. 3, column 6. (Viewed 9 September 2017. G00238). C. C. Patton, Jeweler and Optician, presumably Cañon City, CO. (October 1902). Advertisement: "The Silver Store... Wilcox Silver Plate Co. [ / International Silver Co.] ..." Cañon City Record (Colorado). (Viewed 9 October 2018. B00859-62). Online - Chronicling America project, Library of Congress: 16 October 1902, presumably p. 2; 23 October 1902, presumably p. 2; 30 October 1902, presumably p. 2. Brandeis & Sons, Omaha, Nebraska. (23 November 1902). Advertisement: "... Great Values in Silverware... Wilcox Silver Plate [/ International Silver Co.] Sugar Shells... " [with no illustrations]. Omaha Daily Bee (Nebraska), p. 12. (Viewed 7 October 2018. B00797-98). Macy’s, New York. (6 April 1904). Advertisement: "... Wilcox Silver Plate Co. [/ International Silver Co.] ... " The Sun (New York), p. 12, middle column. (Viewed 2 October 2018. B00659). International Silver Company. (25 October 1905). Advertisement [including listing of Wilcox Silver Plate Co.; with product illustration]. The Jewelers’ Circular — Weekly, p. 33. (Viewed 2 September 2018. H00399). International Silver Company. (1 November 1905). Advertisement: "Rich American cut glass..." [including listing of Wilcox Silver Plate Co.; with product illustration]. The Jewelers’ Circular — Weekly, p. 31. (Viewed 2 September 2018. D00253). International Silver Company. (8 November 1905). Advertisement: "... Many new and seasonable goods..." [includes listing of Wilcox Silver Plate Co.; no illustration]. The Jewelers’ Circular — Weekly, p. 37. (Viewed 2 September 2018. D00257). Brandeis & Sons, Omaha, Nebraska. (12 April 1906). Advertisement: "... Wilcox Silver Plate [/ International Silver Co.] ... " [with no illustrations]. Omaha Daily Bee (Nebraska), p. 12. (Viewed 6 October 2018. B00789-90). International Silver Company. (14 June 1906). Advertisement: "... Makers of Wares in Sterling Silver, Gold and Silver Plate and Rich Cut Glass, Salesrooms[:] Meriden, New York, Chicago, San Francisco... Wilcox Silver Plate Co." [with no illustrations]. Meriden Morning Record, p. 7, col. 1. (Viewed 23 October 2018. B01192). Corning Museum of Glass call no. "Wilcox Silver Plate Co.". Brown University library, Providence, call no. 2-SIZE NK7198.W55 T76 1910z. Winterthur Museum, Delaware, call no. NK7240 W66* TC. Yale University call no. Fiche B2264 3123. Online - Metropolitan Museum of Art, New York. Online - exhibition mention, Cranbook Art Museum. University of Kansas, Art & Architecture Library, call no. N7255.F53 S22 1951. For known exhibitions and dates, see Design Meriden - Wilcox Silver Plate Co. designs in collections, at auction, and in exhibitions. In either 1960 or 1963, Wilcox Silver Plate Co. merged under the trademark of "Webster-Wilcox". Both years are noted in Edmund P. Hogan (1977). An American heritage: A book about the International Silver Company, pp. 164 & 170. However, see "Webster-Wilcox" chafing dish advertised in 1956 advertisement above. Los Angeles Public Library call no. 739.1 I61 1955 folio. Connecticut Historical Society, Hartford, call no. QUARTO 739.2283 I61c, 1947. > Bradley & Hubbard Mfg. Co. (lamp maker and burner supplier) also mentioned. > Wilcox Silver Plate Co.: lavatory set in Art Nouveau style (undated). > Wilcox Silver Plate Co.: mustache cup and saucer (1895). Winterthur Museum, Delaware, call no. NK5104 R45s. Metropolitan Museum of Art, New York call no. HD9536.Uf4 I554 1977. > p. 142 (toilet ware — handmirrors, etc.). Hanson, Bernard. (18 December 1893). Art Deco designs bring back an era (with mention: "There is less classical inspiration in the compact geometric design of a silver-plated tea service created about 1928 by [Jean] Theobald for the [Wilcox Silver Plate Co. /] International Silver Co. of Meriden...") Hartford Courant, p. E14. (Viewed 16 November 2018. D00418). Yale University library, New Haven, call no. YLp95 983D+ Oversize. No exhibition checklist exists (as of 9 November 2018). Offline - press release - Metropolitan Museum of Art [mentions Saarinen’s urn being displayed]. See list of exhibition venues at Design Meriden - Wilcox Silver Plate Co. designs in collections, at auction, and in exhibitions. Kugelman, Alice. (8 February 1987). Stream lines [with photo and caption concerning Paul Lobel for Wilcox Silver Plate Co. / International Silver Co. (c. 1930s). Rounded tea service. (Metropolitan Museum of Art collection); at this juncture, this design is not believed to have been in the two exhibitions mentioned in the article]. Hartford Courant, pp. 188-89. (Viewed 8 December 2018. D00640). Connecticut Historical Society, Hartford. (c. 1987). Exhibition labels / checklist for A decade of collecting Connecticut industrial arts (1 December 1987 - 31 August 1988). [The list might be incomplete.] [Exhibited: "Jean Theobald for Wilcox Silver Plate Co. / International Silver Co. (c. 1928). Tea service." (CT Historical Society collection).] (Viewed 25 November 2018. B01209-17; B01219-20). Offline - exhibition checklist - Milwaukee Art Museum. Yale University Library, call no. F104 M5 V85 1988 (LC)+ Oversize. Mays, Vernon. (5 January 1988). Revolution in design: State industries fired early shots (with brief mention of International Silver Co. [WSPC] and Gene [sic] Theobald). Hartford Courant, pp. F1, F6. (Viewed 25 November 2018. L00898). Henderson, Helen B. (November 1998). Shaken not stirred collectible bar ware [with mention and photo of Lurelle Guild for Wilcox Silver Plate Co. / International Silver Co. (undated). Cocktail serving set in skyscraper style, catalog #5833 beverage set: tray, eight cups signed, shaker and exhibitions at Bass Museum of Art, Miami Beach and San Francisco International Airport Museum]. (For other venues in the traveling show, see the Wilcox Silver Plate Co exhibitions section.) Antiques & Collecting Magazine, pp. 38-40+. (Viewed 28 November 2018. D00580). Metropolitan Museum of Art, New York. (undated). Webpage: Eliel Saarinen for Wilcox Silver Plate Co. / International Silver Co. (c. 1933-35). Prototype tea service. (Exhibition history: 29 June - 14 November 1999, Recent acquisitions of twentieth-century design and architecture at the Metropolitan Museum of Art). (Viewed 8 November 2018. A00455). Online - exhibition history of prototype tea service (c. 1933-35). No catalogue was produced for this exhibition. Johnson, J. Stewart. (2000). American modern, 1925-1940 : design for a new age exhibition catalogue. [See WSPC exhibitions section for list of 6 venues; in exhibition: Lurelle Guild for WSPC / ISC. (c. 1934). Cocktail shaker; Paul Lobel for WSPC / ISC. (1934). Tea service; Eliel Saarinen for WSPC / ISC. (c. 1934). Tea and coffee urn and tray. (All in Met collection)]. 192 pp. (New York: Abrams in association with the American Federation of Arts.) (Viewed 16 November 2018. A01859; A02736; L00867; L00869-71). > Paul Lobel’s tea set design for Wilcox Silver Plate Co. / ISC is shown on the exhibition catalogue cover. Offline - exhibition checklist - Metropolitan Museum of Art, New York. Online - exhibition information - Metropolitan Museum of Art, New York. St. Louis Art Museum. (undated). Webpage for: Eliel Saarinen for Wilcox Silver Plate Co. / International Silver Co. (1934). Urn. [Exhibition history: (14 May 2004 - 20 June 2005), American & French decorative arts 1930s at St. Louis Art Museum]. (Updated 15 November 2018. A01060; A01087; L00807). Online - exhibition mention - Metropolitan Museum of Art, New York website. Online - exhibition history of prototype tea service (c. 1933-35) for Wilcox Silver Plate Co. / International Silver Co..
Metropolitan Museum of Art, New York. (c. 2008). Masterpieces of Modern Design: Selections from the Collection webpage. [Exhibited Eliel Saarinen for Wilcox Silver Plate Co. / International Silver Co. (c. 1933-35). Prototype tea service. (Met collection.)] (Viewed 8 November 2018. A00458-59). Online - exhibition page - Metropolitan Museum of Art, New York website. New York Public Library call no. IQM (Meriden) 10-6446. Gordon, John Stuart (c. 2011). Three entries on Wilcox Silver Plate Co. / International Silver Company designs. In Gordon’s A Modern world: American design from the Yale University Art Gallery 1920-1950. Yale University Art Gallery in association with Yale University Press. (Viewed 15 May 2018. AAA03001; AAA03007-08; AAA03014-15; AAA03020; AAA03025-26; AAA03028). > "Jean G. Theobald, designer; Virginia Hamill, stylist; Wilcox Silver Plate Company / International Silver Company; ’Diament’ dinette set", (1928), (pp. 170-71). > "Paul Lobel, designer; Wilcox Silver Plate Company / International Silver Company; "Tea or coffee service", (1934), (pp. 266-67). > "Jean G. Theobald, designer; Virginia Hamill, stylist; Wilcox Silver Plate Company / International Silver Company; Dinette set", (1928), (p. 294). > Biographical statements on Lobel, Theobald and Hamill, pp. 410, 412 & 420). Conradsen, David and Cortinovis, Genevieve, with Brunstrom, Mary Reid. (2015). St. Louis Modern exhibition catalogue. [Exhibition: 8 November 2015 - 31 January 2016; exhibited design: Eliel Saarinen for Wilcox Silver Plate Co. / International Silver Company. (1934). Urn. Silver plate. (Collection: St. Louis Art Museum, p. 72.)] (St. Louis: St. Louis Museum of Art). 184 pp. (Updated 15 November 2018. AAA00035; A01064-65; L00809; L00864-65). Columbia University library, New York. call no. N6535.S275 S74 2015. Online - exhibition information - St. Louis Art Museum webpage. Offline - press release - St. Louis Art Museum. Also, Offline - exhibition checklist including Eliel Saarinen’s urn. St. Louis Art Museum. Online - Design Meriden, 1(1). Coffin, Sarah D. and Harrison, Stephen. (2017) The Jazz Age: American style in the 1920s exhibition catalogue. 379 pp. Cleveland: Cleveland Museum of Art. [Venues: Cooper-Hewitt, Smithsonian Design Museum, New York (7 April - 20 August 2017) and Cleveland Museum of Art (30 September 2017 - 14 January 2018); exhibited designs: Paul Lobel for Wilcox Silver Plate Co. / ISC. (1934). Four-piece tea service. (Metropolitan Museum of Art collection. ); Eliel Saarinen for Wilcox Silver Plate Co. / ISC. (c. 1932-33). Tea urn. (Dallas Museum of Art collection)]. (Viewed 29 November 2018. A02036-41; A02766; B01246-49). Newark Museum, NJ. (c. 2017). Exhibition webpage for Style and status in sterling: American silver. [Exhibition including: Jean Theobald for WSPC / ISC. (c. 1928). Cream pitcher and sugar bowl on tray. (Newark Museum collection.)] (Newark Museum collection.)] (Viewed 18 November 2018. A02764-65; D00574). Yale University library call no. 1971 S16. Superior Silver Co. / Wilcox Silver Plate Co. / International Silver Co. (undated). Revised price list - white metal hollow ware, electro plated. (Viewed 30 July 2018. C00207-05). Wilcox Silver Plate Co. (undated). [Photographic catalog.] 234 pp. (Viewed 30 July 2018. C00207-07). Warshaw Collection of Business Americana, c. 1724-1977, Archives Center, National Museum of American History, Smithsonian, Washington, DC, Box 3, Folder 5, no. 7642 (finding aid). On Wilcox Silver Plate Co. - 1: designs in collections, etc. | 2: design catalogues, etc.